The aromatic leaves of this shrubby evergreen perennial may be used fresh or dried to provide a delightful seasoning to chicken, stew, and all meats. In mild winter areas, makes an excellent hedge. Elsewhere, it is best grown in moveable containers or as an evergreen. 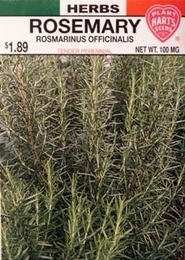 Rosemary flavor is best before plant blossoms. Pick leaves and sprigs as needed and use fresh or dry. Leaves may be frozen. Germinates in - 14-28 days, Rosemary germinates poorly. The seed in this packet is of the highest quality though may only germinate at 25%.